1. Aristarchus Champion of Rochester, N. Y. who owned all of Montville Township, deeded 100 acres of land along Wadsworth Road and six acres in Medina Village to Rev. S. V. Barnes of Berne, N. Y. In return Rev. Barnes became the first full-time minister of the First Congregational Church. 1. The Rev. Samuel Lee, minister from 1835-1838, was paid $350 a year, $100 of which came as a donation from the Home Missionary Society in Washington, CT.
1. William P. Clark moved his select school to the Old Brick Church in 1850. 1. Charles W. Brooks gave an address at the Congregational Convention, in 1859 to colored people of Medina and Summit Counties. 1. In 1863, there were 92 members of the Old Brick Church. 1. Another Medina Village structure sustained damage when the Old Brick Church caught fire in 1877. 1. In 1880, the old brick church in Medina is torn down and a new Congregational Church is being built directly across the Broadway Street. Services are being held in the Phoenix Hall during construction. 1. The property was sold at sheriff’s sale to Macy O. Hallock for $2625 in 1938. 1. The YWCA moved into the house between the Congregational Church and the Medina High School in 1938. 1. Clara R. and Maxwell T. Burnham moved here in 1945 to 1948 while building their new home. House and lot purchased by the Trustees of the Congregational Church for expansion purposes in 1956. 4. Miss Alden was employed as a clerk at the local Post Office for many years and she possessed a fine contralto voice, so she was hired as a soloist at the St. Paul’s Episcopal Church. 5. Miss Alden maintained her interest in the Episcopal Church and became a confirmed member of St. Paul’s where she was active in the work of the Women’s Guild. 7. With the passing of Susan King Alden is gone the last of a respected and renowned pioneer family of Medina. 1. In 1952, House was demolished and a one story 810 square feet small office building was built with two or three private offices, reception area and restroom. Building can be divided into two separate offices with one private office, one reception area, and a separate entrance in each section. 1. Renovation Homes Inc, dba Landmark Homes is a full-service design/build contractor that is focused on the construction of Custom Homes, Additions, Finished Basements, and remodeling jobs in Medina County and surrounding areas. 1. Frank M. Buchanan acquired the property from A. M. Buchanan in 1924. 2. Fire burned part of the house in 1924. Rebuild by F. M. Buchanan in 1924. 1. Eugene M. Clement bought the property from Frank M. Buchanan in 1933. 1. Eugene M. Clement sold the property to Shiloh Fields in 1940. 1. Frank P. Buchanan built the house in 1914 for $2,500. 1. In 1940, Eugene M Clement purchased two adjoining Buchanan properties. 1. In 1983 the Western Reserve Presbytery voted to establish a new Church Development in Medina. 2. In 1985, Reverend James Gilbert was called to serve as a Development Minister. 3. On May 18, 1986, The Medina Presbyterian Church was charted and the congregation numbering 92 began church services in the Seventh-day Adventist Church east of Medina. 4. In May 1988 3.7 acres was purchased at 5088 Burgundy Bay, east of Medina for the location of their new church building. 1. Minnie and William A. Baldwin house for sale, 1 block north of square on Broadway Street, opposite the primary school in 1901. 1. By the last decade of the 19th century, student enrollment in the village schools had increased too much that the Lincoln School was filled to capacity. A school bond issue was approved, and in 1891, the Medina Primary School opened. The school consisted of four large rooms, each with a capacity for 50 students, and was located on North Broadway Street where the County Administration Building now stands. It was torn down in 1921. 1. In 1923, a new High School designed by architect T. Ralph Ridley and built by contractor, V. W. Surber for a cost of $268,038 in 1923 was to accommodate about 800 students. 2. 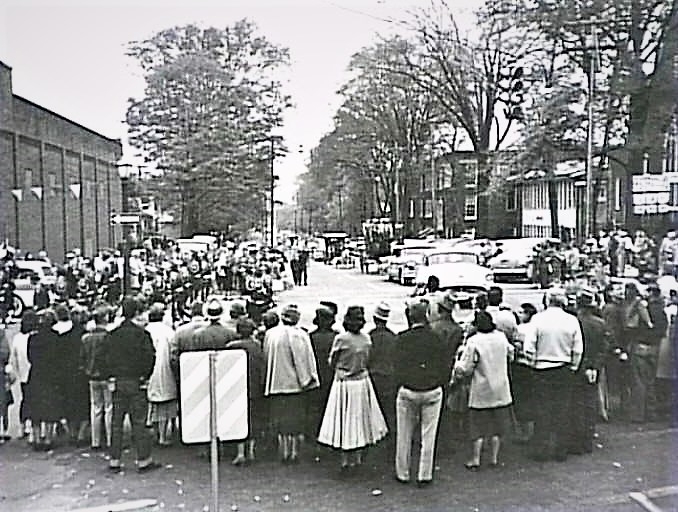 In 1956, during the superintendency of Sidney M. Fenn the high school classes were again moved to a new location on East Union Street. 1. School facility renovated extensively to accommodate County Adminstrative offices in 1974. 1. Medina County Commissioners paid the Medina City Schools $800,000 for the building and property in 1974. 1. R. E. Leister purchased the property from Roland Clement in 1946. 1. Rufus Ferris arrived in Mecca in Medina Township on June 11, 1816, from New Milford, Connecticut, which was also the home of Elijah Boardman. 2. In 1817, Ferris bought the land from William and Henry Boardman for $12.00. He first built a comfortable log cabin, but Mrs. Ferris still did most of the cooking out-of-doors. 3. His wife, Hannah, willing fed anyone who came to their door and gave them a bed for their tired heads. When the first family with women and children showed up at her door, she "spatted her hands" for joy. 4. This log cabin was located one-half mile north of the present Public Square. A little later he also had a large frame barn built in which the first county court session was held in 1818 on the site of the present Lutheran Church on North Broadway Street. 5. Elijah Boardman secured Rufus Ferris as an agent for the sale of his Medina land and placed him in charge here with abundant means for operating expenses. 6. Mr. Ferris kept open house and devoted himself to entertaining strangers who would be likely to buy Boardman land. At the same time he pushed the work of clearing and improving the place with all the means at his command. 7. Rufus called himself a "Hickory Quaker." This means he was flexible, but strong and tough, like a hickory tree. Many of the Ferris families were Quakers. He "wore his Quaker hat proudly." But was flexible enough to be a founding member of the Episcopalian Church, St. Paul's! 8. In addition to having the distinction of being the first settler within the present corporation limits of Medina, Mr. Ferris also became a man of prominence in the community and was much respected by his fellow citizens. 9. He was chosen the first county Treasurer in 1818 and held this office for fourteen years. 10. In 1819 he was appointed the first postmaster of the newly created Medina Post Office, which he kept in his residence. 11. In 1819, he was one of the leading participants in Medina's first Fourth of July celebration, during which the principal streets were named. 12. In 1820, Rufus Ferris became a charter member of the Medina Masonic Lodge No. 58, A. and F. M., and of St. Paul’s Episcopal Church of Medina. 13. When the stage coaches from Cleveland to Wooster began to run through Medina Rufus Ferris' home first became a regular stagecoach inn. 14. In about 1825, Squire Ferris built a larger brick home to take the place of his log cabin. It was solidly built, had ten rooms and eight fireplaces to provide warmth for his guests. 15. After a few cases of cholera had appeared in 1833-1834 in Medina Village, Rufus Ferris, Sr., went to Columbus with cholera specific or remedy, because he had volunteered his services to treat the disease, then prevalent there among the penitentiary convicts. 16. However, when his presence was no longer needed there, he started homeward but died of cholera himself near Wooster. Not being retained there, Rufus was brought home to Medina in a Pennsylvania covered wagon." 17.. After the death of Ferris in 1834 his wife Hannah continued to operate this stagecoach inn until about 1847. 1. The Ferris stagecoach inn then became a residence in 1847 when Hannah Ferris sold the property on Lot 177 to Fred H. Brown. In 1869, Betsey Barnes sold the property on Lot 177 to Samuel Scott. In 1889, Elmer J. Scott acquired the property from the estate of Samuel Scott. 1. In 1905 Mr. Barrow purchased the property and Lot 537 from Samuel Scott by Administration. 1. George H. Hoddinott purchased the property and Lot 537 from K. A. Barrow. 1. The Ferris house is identified after 1915 as the Dannley House. 2. The gable roof was replaced with a square top and the fireplaces and their chimneys were removed. 3. A porch was later added, so that Rufus Ferris would not recognize his inn unless he went to the cellar and saw the original huge beams and their outer walls. 4. January 20, 1920; Mr. Charles Dannley, whose home is very popular with the Medina young people, entertained a bunch of 0. S. U. boys and their guests after the concert Wednesday evening. Mrs. Dannley furnished entertainment for four students, and two Medina friends who were entertaining two each were also invited. Together there was a most entertaining party, and those who participated rejoiced over the privilege. There was a good social time dancing and later refreshments. The party broke up about 1 a. m.
1. In 1949, Dennis and Janet Dannley acquired the residence from Charles F. Dannley estate. 1. Mildred and Dr. Reutter purchased the Ferris House from George R. Dannley in 1951. 2. Dr. Franklin Reutter was a retired Eye, Ear and Nose Specialist. 1. Remodeled and modernized, with graceful white columns in the front, Rufus Ferris original stagecoach inn has now become the Laribee Law Offices on the west side of North Broadway, just south of its intersection with Union Street. 2. With roots stemming back to 1898, Henry Laribee joined Arthur Van Epp in 1938 to form the law firm. 3. Prior to practicing law, Mr. Laribee served as a high school principal and administrator in Homer and Spencer Townships, and Mr. Van Epp held the position of mayor of Medina. 4. The firm was first located at 32 Public Square for many years and relocated to the historic "Ferris House" in 1968. Henry Laribee's sons, Ray and Richard, followed in their father's footsteps and joined the practice in 1967 and 1969 respectively. 1. Paul Hertrick joined in 1981, bringing to the firm his vast knowledge in the area of family law. 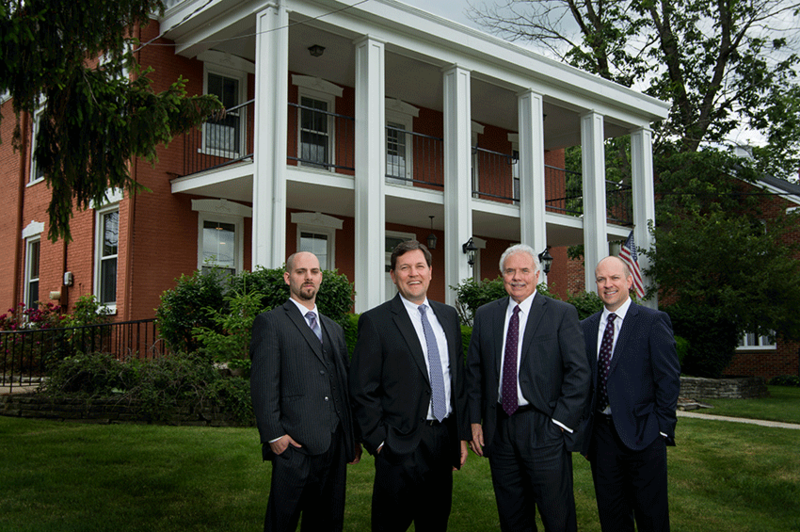 1 Michael Laribee joined the firm in 1996, representing the third generation of the Laribee family to practice law in Medina. 2. Richard Laribee passed away in 2002. 1. In 2011, Marc Hertrick joined the firm after practicing law at larger law firms located in the Washington D.C. metro area and Cleveland, Ohio. 2. In 2016, Ray, principle in the Laribee Law Firm retired after 49 years of practicing law in Medina.